Kingston personal injury lawyer, Frank Van Dyke has over 20 years of experience obtaining fair compensation for the injured and the disabled in Kingston and throughout eastern Ontario. Van Dyke Law will move your case towards resolution in the most expedient and prudent fashion possible, taking great care to thoroughly quantify your damages and prepare the matter for settlement or trial. 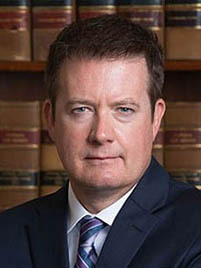 Van Dyke Law advocates for its clients in a firm and professional manner to handle all their concerns, issues and disputes with insurers and other parties. Injuries and accidents are a part of life. When you or someone close to you is injured or involved in an accident, it is important that proper compensation is obtained for pain and suffering, loss of income and other damages. Van Dyke Law will work closely with the injured victim to ensure that they receive everything they are entitled to by law. Injuries and accidents happen daily. If you have been injured as a result of an accident or you are not receiving the compensation to which you are entitled, it is important to consult with an experienced Kingston personal injury lawyer. We provide legal representation of a high standard and we do not charge any fees until the successful conclusion of the matter.